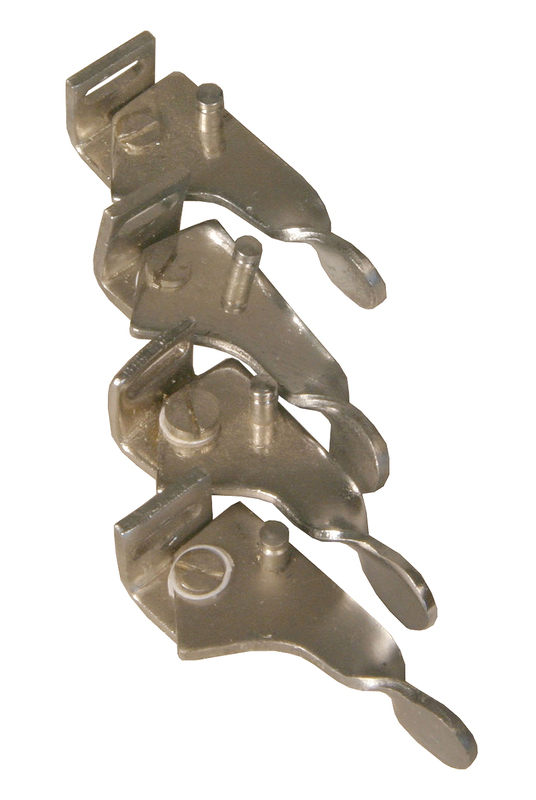 Pack of 4 Replacement Screw-pivot, Single pole sharpening levers with shiny finish for harps. The Lever has a screwed arm that lifts to change the note of the string from the natural note to the sharp. The screw holds the arm, but is not adjustable for tension. When the lever is down it is free of the strings. When the lever is in the up position, it is engaging the strings. These have a Grooved Single pole mechanism, usually used for shorter and thinner strings. Measure your existing levers carefully to match the size. With the lever in the down position, measure from the anchor plate of the lever the part screwed to the harp to the pole. The distance to the pole is 8 mm. The over all length of the lever in the down position is 1 3/4 inches 45 mm. The length of the pole itself is 5 mm. The amount of lift, can be adjusted by pulling or pushing the bridge pin in by a 1/16 of an inch. This changes the point at which the string is engaged by the pole. You can also loosen the screw holding the lever to the harp and move the lever up or down. Again, by only a 1/16 of an inch at a time; very minor changes will have profound effects on the string's notes. You need to supply your own 5/8 inch wood screw to attach the lever; available at most hardware stores.